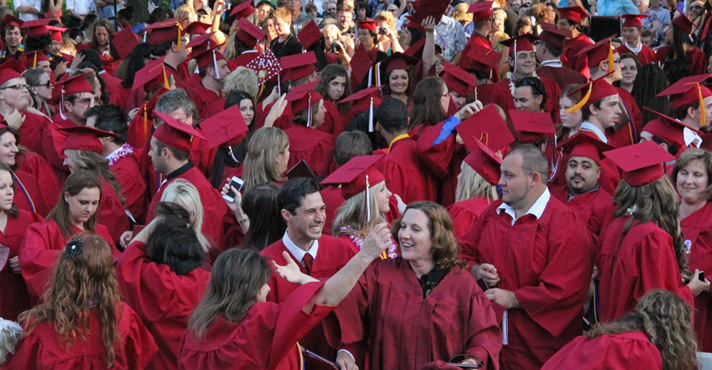 The commencement ceremonies are an appropriate conclusion to a successful academic career at Sierra College. The educational success that the award of an Associate degree represents demonstrates considerable sacrifice, hard work and commitment. The ceremony itself takes place once a year at the end of the Spring semester. All students who complete a degree in either Fall, Spring or Summer of that academic year are eligible to attend. You must have submitted a degree petition to the Admissions and Records Office by the appropriate deadline. Participation in commencement does not guarantee a degree. The College bookstore will have caps, gowns and tassels available for purchase. There is not a limit to the number of guests that you can invite to the outdoor ceremony, but in the event of rain, the ceremony will be held in the Theatre for the graduates ONLY. Due to limited seating, guests will not be allowed. The ceremony will be streamed online. This link will be accessible on this page on the day of the event. In an effort to assist in getting you and your families out of the parking lots, Sierra College Security and the Rocklin Police Department will be directing both pedestrian and vehicle traffic. Both campus exits will take you to I-80 east or west; please follow the signs and the directions of the Officers at those intersections. Drive safe! For further information please contact the Hub, hub@sierracollege.edu or (916) 660-7300. Parking lots 1, 3, 4, and 6 will be available for public parking. Use Lot 7 and 8 for handicapped parking. Elevator and stairway access to upper campus Bell Tower Quad, where Commencement takes place, will be available in buildings N1 and N2. Signage and staff will direct guests to upper campus. The Bell Tower (N4) elevator or stairwell will not be available for use to accommodate Commencement activities near this location. Our ceremony is very intimate, heartfelt and personal. We don’t have the students wear cap and gown, but do insist on clean, tidy and mountain best.